Home > News > The State Guest House open to the public ! The State Guest House open to the public ! Today is the day The state guest House open to the public. The State Guest House was originally built as the Crown Prince’s Palace (later called the Akasaka Palace) in 1909 on a part of the vast site that was once the Edo (present-day Tokyo) estate of the Kishu-Tokugawa clan, one of the major branches of the ruling Tokugawa family. The building, made of bricks reinforced with steel frames, consists of two floors above ground and one below. It is an earthquake and fire resistant structure. It was built by the concerted efforts of leading architects and artisans under the overall direction of Dr. Tokuma Katayama, a famous Meiji – era architect. 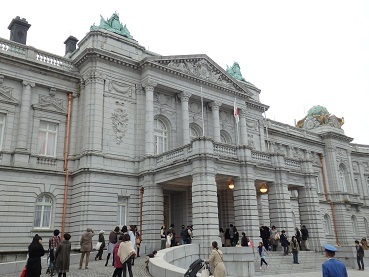 It is the sole neo-baroque style European palace building in Japan. However, the building was hardly used as a residence for the Crown Prince, except that Emperor Showa and the Present Emperor resided for a short period. After World War 2, the management of the building and its land was transferred from the Imperial House Hold to the Government. It was subsequently used for public institution and bodies such as the National Diet Library, the Cabinet Legislation Bureau and as an office of the Tokyo Olympics Organization Committee. During the postwar period, Japan reintegrated itself into the international community and developed closer ties with other countries. Since it was starting to welcome an increasing number of state and official guests from abroad, a policy was developed to build a facilities was initiated. As a result, it was decided in 1967 to restore and remodel former Akasaka Palace to serve as the State Guest House. The restoration and remodeling works were completed in 1974, taking more than five years since the start of 1968 and costing a total of 10.8 billion yen. At the same time, a Japanese-style annex building was newly built for receiving guests in a traditional Japanese atmosphere. Since its opening, the State Guest House has provided accommodations for state and official guests including monarchs presidents and prime ministers from countries throughout the world. It has become an illustrious stage for diplomatic activities, such as welcoming ceremonies, meetings and receptions with leading figures in the political, business and academic circles. It has also served as a venue for important international conferences including the Tokyo G7 Summit meetings (1979, 1986, 1993) and the Japan-ASEAN Commemorative Summit of 2003. After the large-scale repair works, which started in 2006 and continued for about three years, the operations of the State Guest House restarted in April 2009. In December of 2009, the main building of the former Crown Prince’s Palace), together with the front gate and the fountain in the main garden, was designated as a national treasure. Why don’t you go and see in this oppotunity ?